For a limited time only, get your copy of, Think, Trade, & Grow Rich! A Powerful Beginner’s Guide to Building Passive Income Through Momentum Swing Trading and Stock Market Investing (valued at $24) for FREE! Offer valid until 11:59 PM PST 08/14/2018. Piggy-cide: The deliberate and unlawful killing of a ceramic piggybank; onset by financial hardship and multi-hour commutes to and from an unfulfilling and underpaying job. Think, Trade, and Grow Rich! 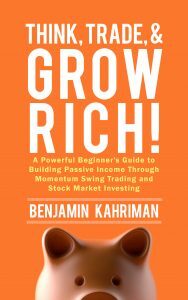 A Powerful Beginner’s Guide to Building Passive Income Through Momentum Swing Trading and Stock Market Investing is your (and your piggybank’s) ticket to financial freedom. Within these pages, you will find a true beginner’s guide to the author’s time-tested and results-driven trading and investing method. As you progress through the trading system, you will generate income capable of covering your living expenses and have passive income to live the life you always imagined. This is your opportunity to break away from the shackles of a nine to five, to no longer be subject to your boss’s moods and whims. Think, Trade, and Grow Rich! is your invitation to embark upon a path of limitless financial opportunities. No prior experience or knowledge about the stock market, investing, or trading is needed. Kahriman guides you through the trading process, step-by-step, in simple, understandable language. Years of research, data analysis, and trading experience are distilled to an easy-to-follow trading method that dramatically increases profits and minimizes risk. Kahriman teaches the fundamentals of Japanese candlesticks, technical analysis, momentum swing trading and investing. After years of research, mentorship, data collection, analysis, and countless hours practicing trading and investing with stock market simulators, Kahriman created a trading system designed to minimize risk and maximize profit. Kahriman opened his first brokerage account with just $500. After one quarter, that account grew well over 1,500%. With the goal of helping us all realize our own “American Dream,” Kahriman embarked upon telling his story and teaching others to invest and trade in the stock market. In Think, Trade, and Grow Rich! Kahriman outlines his powerful trading and investing formula. Kahriman explains how you too can realize your dreams and reap the bountiful financial opportunities present in the stock market. Best of all, Kahriman demystifies the technical, hard to understand, and complicated aspects of trading and investing. Think, Trade, and Grow Rich! is concise, practical, and written for everyone, in effect, a true and complete beginners guide to not only trading but a better life. Scroll up, hit the buy now button, and embark upon a path to financial freedom. A path to the life you always imagined.